BOOK EARLY SO YOU CAN ENJOY YOUR NEW OUTDOOR SPACE! creating your new landscape . . .
We help you visualize the beauty of the end result before the work even begins. From low-maintenance solutions to beautiful stonework and planting options- to help you achieve the results you are looking for. We will meet with you on site for a consultation. At this time we will discuss your vision for improving your outdoor living space. Taking into account your ideas and vision, we will discuss the possibilities that can be created within your budget. Within a short period of time, you will receive a detailed estimate of costs and timeline for completion of your project for your approval. We want to ensure we have a mutual understanding of needs and limitations to provide optimal results. To guarantee a smooth process, one crew and foreman will work on your project from start to finish. We feel this is the best way to ensure continuity of service. Site conditions vary greatly. Renovation of existing yards will require removal of old material to make room for new and improved materials. We will often discuss and approve layout and placement of new items. Your input is critical during this stage of the process to ensure complete satisfaction. Proper site preparation leads to efficient progress. Materials and equipment will be constantly moving and changing the landscape. Day-to-day operation will result in successfully reaching your visions. Upon completion of your project, we will walk you thru your refreshed outdoor space. We will take the time to explain and demonstrate all aspects of your stunning new landscape creation. Tired of your yard? Does it need a minor face-lift or a major overhaul? ROCKSCAPES can help rejuvenate a mature yard, or just fix those nagging little problems. Renovation involves removal of large quantities of old materials from trees & shrubs to old lawn and ground cover, ROCKSCAPES takes care of all of those needs. We carefully install high-quality Manderlay Draught Resistant sod to create a beautiful, natural green lawn. We provide your first fertilization and roll your sod to ensure correct installation. We create beautiful, durable, and unique patios, pathways, planting bed borders and driveways, using only superior Premium Barkman products. We install retaining walls to remedy any grading issues you may have. Planters and retaining walls add dimension and visual interest to your yard while allowing you to designate space for special planting. Continuous concrete edging can complete a new project or completely revitalize an old yard in need of refreshing. 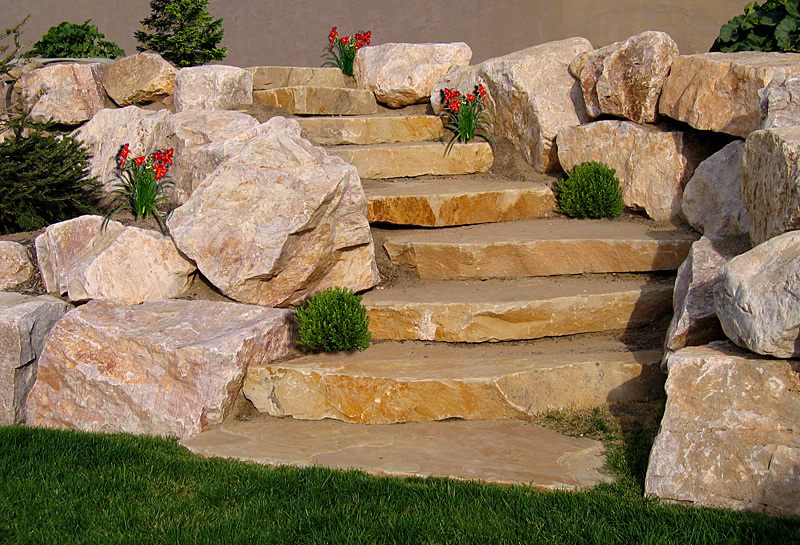 Whether an accent, stairway, or garden, stone and boulder can create visual texture in our yard. ROCKSCAPES Landscaping will work with you to select the best trees and shrubs for your yard, considering home architecture, lot shape and size, orientation to the sun and most importantly your personal taste. We use only the healthiest trees and shrubs, handpicked by us. Tired of cutting grass? 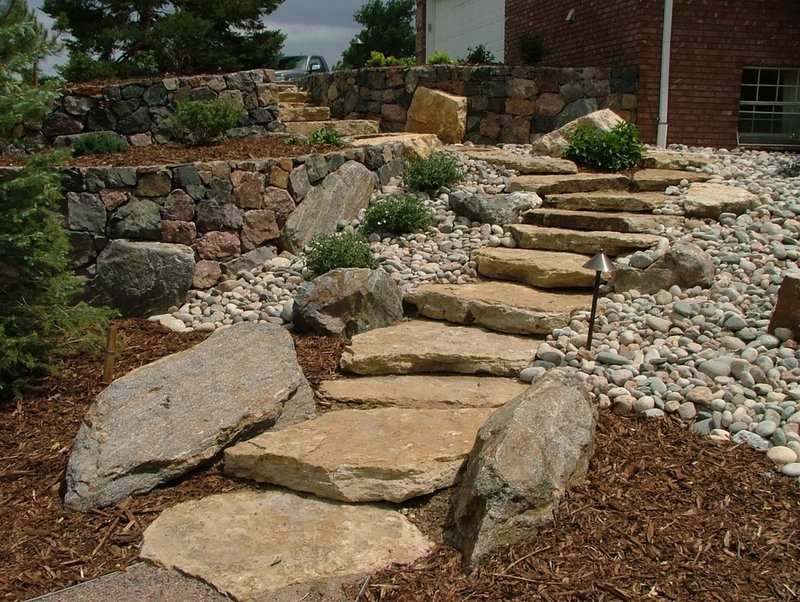 ROCKSCAPES can provide many low maintenance options for your consideration such as rock beds, mulch and plant cover . Enhance your landscaping plan by adding a water feature. Let the ROCKSCAPES experts help you choose a pond, waterfall, or fountain.